The Events page shows all the past, present and future events and open to-dos in your project. The Dates page will show upcoming events and any open to-dos with a date. Add a new event by clicking on the date. 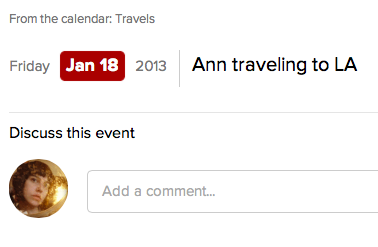 To-dos can't be added to the calendar, since Basecamp doesn't know which list to put them in. Add to-dos from a list in your project and you can assign dates there. Click the 'Agenda view' link to see a list of all events and open to-dos. Discuss or edit any event or to-do by clicking on the event title. All your dates also appear in the global Calendar. Learn more in our Calendar Guide.